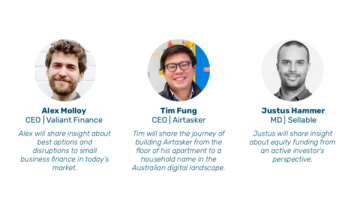 Three of Australia’s most successful start-up founders - Airtasker CEO Tim Fung, Spreets founder Justus Hammer and Valiant CEO Alex Molloy - will teach entrepreneurs how to access funding to make their start-up a household name at a Business Connect event at the Hilton Hotel in Sydney on 10 May 2018.
Business Connect is the NSW Government program that provides trusted advice to help people start and grow their small business. The ‘From a start up to a household name’ event is an exciting opportunity for start-ups and small businesses to learn from highly successful entrepreneurs on how they built businesses from scratch and how to access the finance to develop, compete and win in the digital age. 'Constant innovation is the lifeblood of the NSW small business community. Business Connect and great events like these demonstrate the commitment of the NSW Government to support innovation and help businesses access the capital to be able to act on their growth ambitions,' Mr Molloy said. Mr Fung will speak about his experience of building NSW-based company Airtasker and raising more than $30 million in funding in just six years. Mr Hammer will talk about equity-raising for small business from an investor’s perspective, while Mr Molloy will provide advice on access to finance for small business and start-ups. This panel event will include a Q&A session and an opportunity to network with other start-ups and small businesses attending.